To those who have been to previous NDP shows, we all know that we have to queue to collect our NDP fun packs. Even though the highly anticipated goodie bag is worth it, the dreaded wait in the humid weather does dampen our moods slightly! 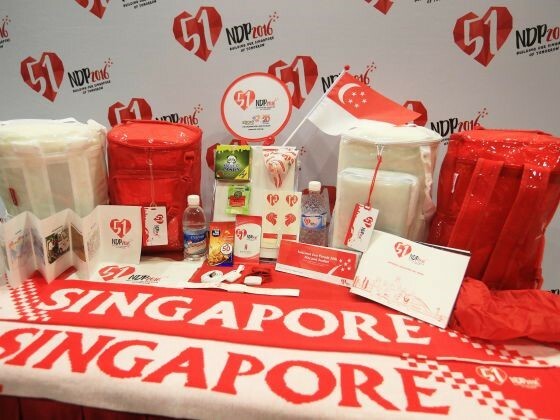 This year however, the NDP fun packs were placed on every seat, making it so much more convenient for spectators. Thank you NDP for the thoughtful gesture! We must also mention that the design of the fun pack is fuss free, lightweight, waterproof (new beach bag that can keep my belongings dry!) and versatile (can be used as a sling or haversack) in the colours of our national flag. Everyone was given a LED wrist brand in the fun pack which is synchronized to the music and light displays during each performing act, increasing the interactivity and participation of the audience. With the many different modes and colours, we loved how it was a beautiful sea of light with a message put across to the citizens of Singapore – that we are One people, One nation. 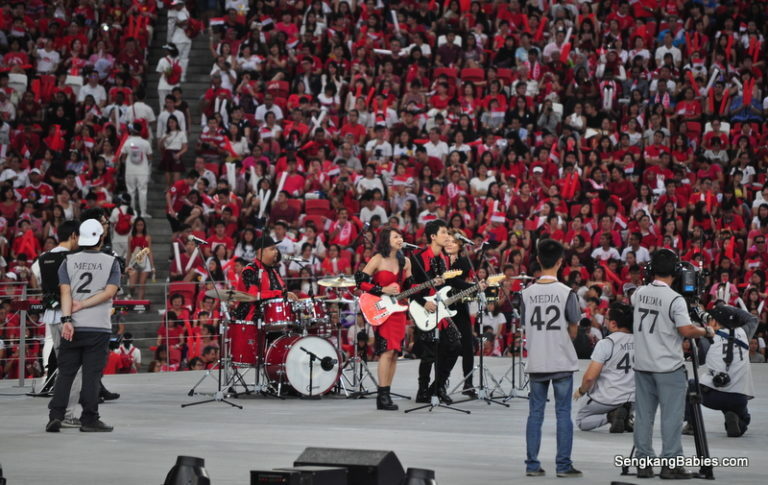 Believe it or not, it has been a good 10 years since National Day was held at the National Stadium! This year, we’re finally back at the new National Stadium, a larger space which is able to accommodate 30,000 more seats than the floating platform. This also means that more Singaporeans were able to join in the fun and celebrations! The cutting edge technology of National Stadium’s retractable roof surely signifies how far Singapore has come in these 51 years in the field of technological advancement. Did you know? 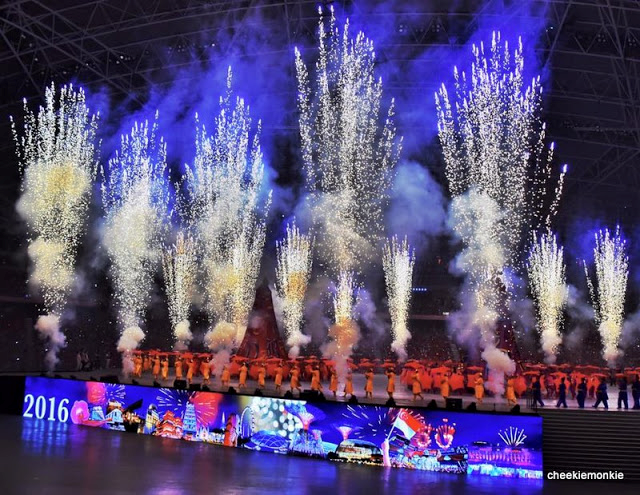 This year’s fireworks display at the National Stadium was the largest scale of indoor fireworks! If you remember last year’s Southeast Asian Games, the indoor fireworks at this year’s NDP is actually five times larger in scale! WOW! 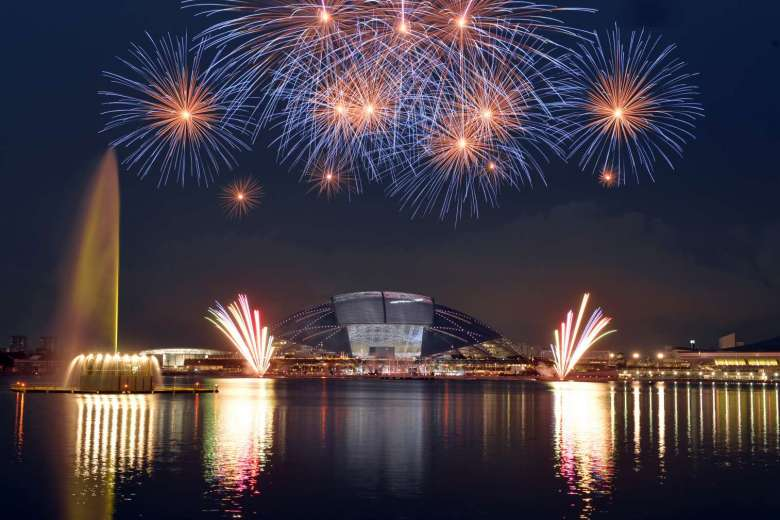 Those who did not manage to grab tickets to attend the NDP, we hope you didn’t miss the fireworks display that was set outdoors, over the Kallang Basin!. No NDP is complete without fireworks and we were in for a treat with an impressive and magnificent display of fireworks, both indoors and outdoor! The use of 3D projections for this year’s NDP provided a refreshing experience to the crowd as it was something out of the ordinary NDP acts from the previous years. 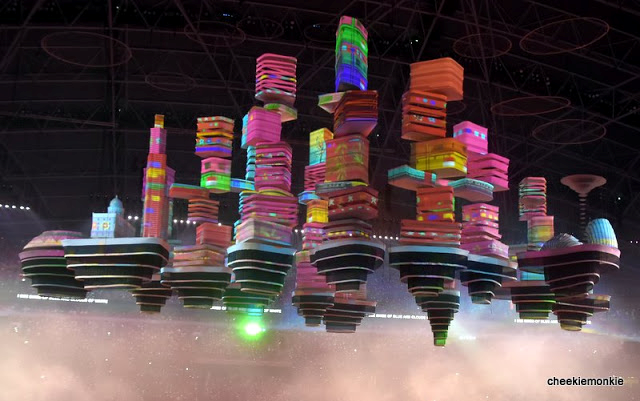 Tying in with Singapore’s vision of being a smart city, the 3D projections played a big bulk in the narration of Badang and the Singapore story. This not only greatly helped audiences follow the storyline of the show but also visualize how Singapore would be leading up to SG 100! How can we forget about the Kallang Wave? Since this year’s NDP was held at the National Stadium, it was more than heartwarming to be able to be part of the Kallang Wave after 10 years! What better way to celebrate our nation pride than to do the Kallang Wave during the nation’s 51st birthday! A heartening segment of this year’s NDP was to bring out the importance of inclusiveness in Singapore. A nation is only as strong as its weakest link and as Singapore progresses, it is also crucial for us to unite as a country that does not leave anyone behind. This year’s inaugural introduction of a song singing segment saw both audience and performers singing our National Day favorites in unison. Sweetheart, Neoh Yew Kim from the Singapore Association for the Deaf performed along with 150 volunteer with special needs. It was definitely a joyous occasion to see the whole stadium in hearty grins, singing and signing along. 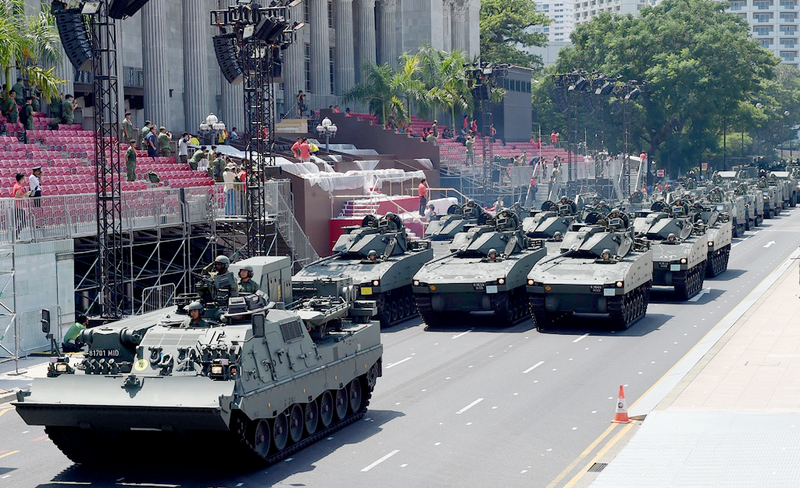 Of course with a brand new venue, there would be things that we miss from previous National Day Parades! Unfortunately, due to the stadium’s design, the audience had restricted view for the array of outdoor fireworks display. As one of the highlight of the NDP, it is understandable that many may be disappointed with the limited view of fireworks. However, with the grand indoor fireworks addition to this year’s parade, I am sure that the audience still appreciated the firework display to usher in our country’s 51st birthday! 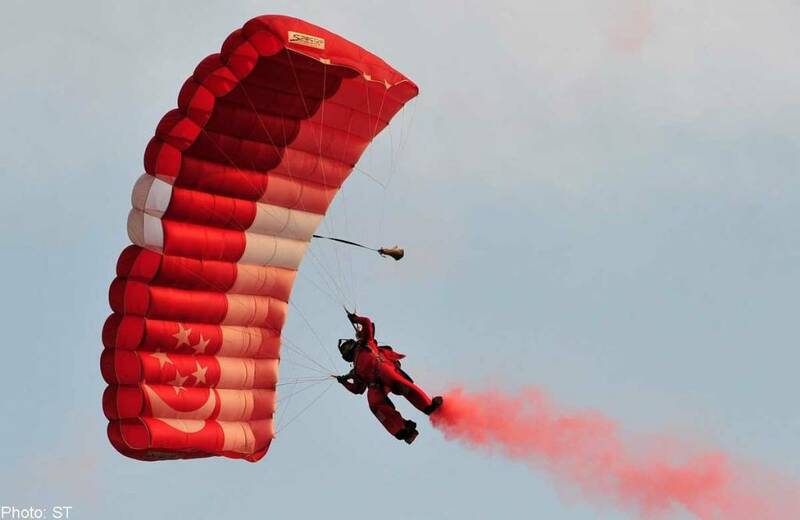 The annual Red Lions parachute display, also a highlight at every year’s NDP, was sadly not part of this year’s NDP due to safety reasons. 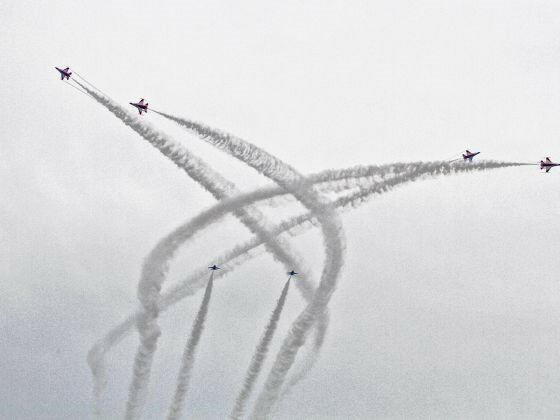 Admittedly, we love to watch the Red Lions parachute performance as they take their jump from above! We definitely miss this exciting parachute display and hope that in the coming year, they would continue to be a part of the NDP tradition! Another yearly tradition and one of the most exciting segments of the parade, we’re missing the loud thunderous roars and magnificent showcase of the Singapore aircrafts jetting across our sunny sky. You may or may not have noticed that the mobile column segment was also not a part of this year’s NDP. While there was no military vehicles that showcased our military might this year, there were still many other refreshing new elements in the show that we thoroughly enjoyed! Some felt that the singing segment could have been longer! 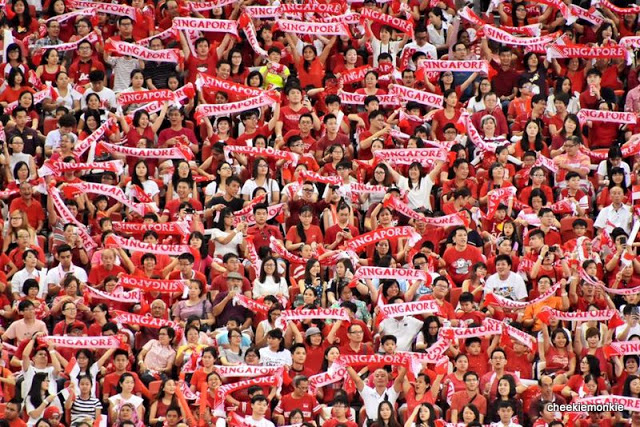 After all, it’s only once in a year where Singaporeans get to sing national day songs with gusto! Our hearts are always warmed by the lyrics of the songs as it speaks about the love we have for our country and people. Nevertheless, this year’s NDP theme song “Tomorrow’s Here Today” by 53A sings of our hope and dreams in the coming fifty years as our nation tackles new challenges and celebrate our victories together. The pop song is youthful, forward looking and upbeat; we can’t help but sing along with glee when we hear and sing along to the song! As the song says, “Take a leap and you will fly, With all the wishes that you own, Make your dreams light up the sky, Home is where you’re not alone” we encourage all Singaporeans to live their dreams courageously! 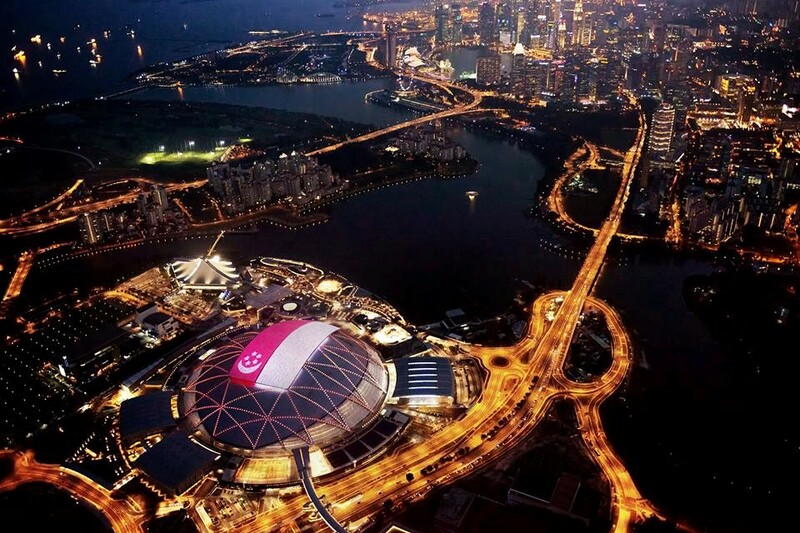 All in all, even though there were some segments that were excluded in this year’s NDP, new additions such as the indoor fireworks, 3D projections, and the use of drones provided a new and different experience for us this National Day. With this year’s NDP message “Building our Singapore of tomorrow”, it is the first show of the next fifty years as we march together as one united nation! We are also glad that we were once again a Major Sponsor in this year’s NDP 2016, supporting them on the online front. You can also check out #NetccentricxNDP2016 for more coverage!